One of the most incredibly annoying questions that I have been asked over the last ten years in India is whether Russians like Indians. Depending on who asks the question, I chose whether to give a tongue-in-cheek response or engage the person in conversation. Personally I believe that there is very little difference between getting preferential treatment because of your nationality/race and getting discriminated against because of the same. In all fairness, I’d like to believe that I’ve been treated wonderfully well in Russia because I respect the country, its culture and its people, and not because there is some sort of privilege that comes with the Indian prime minister and the Russian president being good friends. 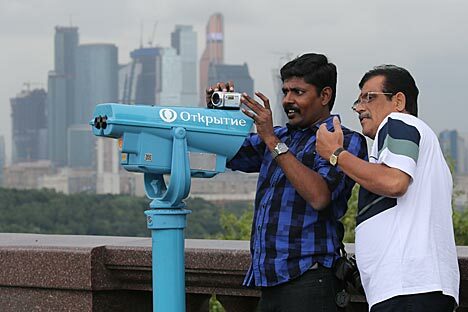 Experiences of most Indian visitors, especially those who speak Russian, to Russia tend to be positive. The ones who have had bad experiences don’t necessarily attribute them on account of their being Indian. It would be fair to assume that India’s reputation for spirituality, openness and being a “good” country does help an Indian traveller. This good impression has a lot to do with the universal appeal of Indian culture, music, films, history and yes, cinema. Those in Russia, who loved India before the collapse of the USSR did not suddenly develop cold feelings for the country once Boris Yeltsin came into power. Similarly the good friendship between Manmohan Singh and Vladimir Putin isn’t going to make Indophiles out of Russians who don’t have a particular fascination for the East. Case in point, Russia and China are experiencing a political bonhomie that was unthinkable around 15 years ago. Their riverine border in the Far East was heavily fortified for decades and mutual suspicions were very high. Now, both trade and diplomatic ties are at an all-time high between the two giants, but this may not necessarily translate into Chinese citizens from the other side of the Amur to get a red carpet welcome when they cross over to Russia. At one time, it was believed that there were more than 3 million Chinese citizens in Siberia and the Russian Far East and there was some kind of a ridiculous fear of a Chinese takeover of the region. While most people have understood that there is no official policy in Beijing calling for a demographic invasion, a Chinese person may not find places in the Russian border regions very open. This is again a generalised statement. The situation is obviously different for Indians who visit the Russian Far East since no one could possibly imagine them to be a threat. If a person tends to have unique features and completely stand out, he or she naturally would be a subject of a lot of attention. India’s great image and soft power also helps in such a situation but only to an extent. I knew of an Indian professional working for a sub-contractor of an oil company. To put it mildly, this is not the kind of person I would ever invite home for dinner in Bombay. He used to complain about the mean, rude and hostile people and had an extended vocabulary of adjectives describing the locals. It leaves me with no doubt that this man would get treated the way he does anywhere in the world, India included, since he has a major attitude problem. I heard somewhat similar complaints from another Indian in Russia, who had his own self-esteem issues. My only advice to him was that if he was going to walk around like a person with an inferiority complex, then it’s very unlikely that he’d be treated with more respect than he has for himself. When it comes to Russians visiting India, it’s again more likely that someone from Russia may feel more welcome in a place like Bangalore than he or she would be in Goa. The local drug mafia and some unscrupulous politicians have been working extra hard to convince the laidback people of the beautiful western Indian state of a “Russian invasion.” Given the large number of Russians in Goa and the fact that they are not really exotic in the state, they could expect a variety of experiences. People in other parts of India that are not used to seeing Russians would be more curious and open. All these factors balance each other out at the end of the day and it’s really one’s own attitude that determines how he or she gets treated in a foreign country, regardless of the relationship between governments and regimes. While we were jogging one evening in Novosibirsk, a local friend told me that he could easily tell the difference between Africans and Afro-Americans. When I asked him whether it was the hairstyles or the clothes, he replied that it was more about the confidence that they walked with. We spotted a man with African featured a bit later that evening and I asked my friend to tell me whether the man was from the beautiful continent or from America and he indicated that it was the latter. When we approached the young man, we found out that he was from Ghana and studying there on a scholarship. He also told us how much he enjoyed his time in the city and how friendly everyone is in Siberia. My friend was both happy and relieved to know that his city and “neighbourhood” were kind to the student. He’d heard plenty of stories of Russian intolerance this student’s happy experiences left the Novosibirsk-resident beaming with pride.